18 Haunted And Scariest Halloween Makeup Ideas For 2014. Please Don’t Be Scared! 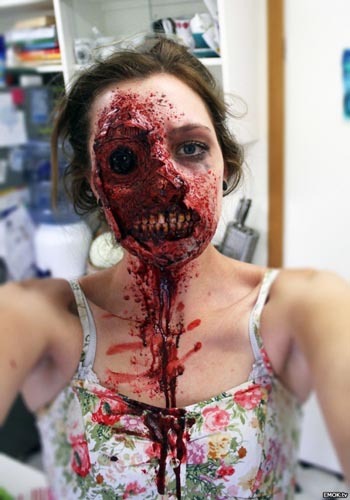 Halloween makeup ideas for 2014, hope you have seen our previous post regarding this 21 Creepiest Halloween Makeup Ideas For You To Try This Year!. Here is another list of Halloween makeup ideas for your inspiration this year. I would suggest don’t try these in front of little kids. The onset of the so-called “bear” months herald the merry arrival of the seasons (and vacations) to come. We always love to end the year with beautiful memories. Halloween is just around the corner. Halloween costumes and Halloween makeups are two crucial agendas for you to start thinking about by now. If you want to try Halloween makeup ideas this year, then this list can be very helpful to you. We highly recommends you to check out these 18 most scariest Halloween makeup ideas. 6. Ripped Flesh Wound Make Up. 10. The Evil Queen/ Witch.